Are you aware of the fact that the N1 and N2 in the Western Cape will be tolled as from next year? It seems the country has been focused on the whoo-ha of all the new toll gates in Jozi that we’ve hardly had a moment to focus on our own province! From what I can find, in 1998 Protea Parkways Consortium submitted an unsolicited proposal to SANRAL (South African National Roads Agency LTD) about upgrading and maintaining the N1 and N2 highways. 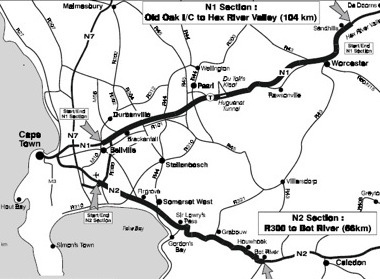 This was granted in 2000, however, the government had a few adjustments for the N2 proposal in the Helderberg area. In 2003, SANRAL adjusted the proposal to include a “Cut and cover tunnel” in Helderzicht up to Victoria Street. A “Cut-and-cover” tunnel “is a simple method of construction for shallow tunnels where a trench is excavated and roofed over with an overhead support system strong enough to carry the load of what is to be built above the tunnel.” – www.Wikipedia.org. On the N1: The Old Oak Interchange just before Brackenfell up to the Sandhills Interchange, which is after you leave the town of Worcester. On the N2: From just after the airport at the R300 interchange all the way over Sir Lowries Pass to Bot River which is after Grabouw and Houwhoek. Now for those of you who have sat in the traffic when there’s been a broken down car or car accident in the Huguenot Tunnel on the way to Ramfest / Earthdance / any party at Nekkies, which vouch for how long one can wait to get through the tunnel. One of the proposed improvements through the toll process is the make the current tunnel (both lanes) one way and then to create a new tunnel (the opposite direction). Considering Cape Town is growing as quickly as this is, this seems like the logical thing to do. Our highways were increased and improved for the Football World Cup and why shouldn’t the rural benefits benefit too? 1) Cost: Will using the toll cost an arm and a leg? Currently it’s R25 for a light vehicle one way from Paarl through to Worcester (Huguenot Tunnel) which is a lot higher than the tolls in Johannesburg (my last toll at Oppikoppi was R9!). 2) Logistics: Will regular travellers be granted a travel card type option since they travel so frequently? Surely they won’t be expected to pay the full rate if they travel through the toll each day? 3) Alternative Routes: For example: If you live in Brackenfell are you going to have to pay the toll to use the Okavango exit?! Or Joostenberg Flakte, how do you get there should you NOT want to use the toll? Currently, using the tunnel in Paarl is an option, will the same option be given on the N1 route? I don’t mind expansion but freedom of choice MUST be an option. The government didn’t even solicit this idea! They were propositioned, which is far enough but then the public must have options. Some money making business shouldn’t place a compulsory monopoly on the general public because the government chose not to upgrade the roads via their own means. Should you like to protest against these tolls (which won’t help since it’s already been passed) then check out the Facebook Group: Stop The Proposed Toll Gates!